This might be my Challenge "Star" for our Mystery Round Robin. ... or maybe this one. If you are a little shakey about terms called "Half Square Triangle units (HSTs)", or "Quarter Square Triangle units (QSTs)", some of this might help. I remember a time when none of this sunk into my head - it was all so overwhelming! For a Half Square Triangle - determine the finished size of the unit. My unit above (see the corners) finish at 4 inches. Therefore, I added 7/8 to that measurement and cut one light square and one med. blue square each at 4 7/8. Pair them right sides together, and draw a line from corner to corner. Sew 1/4 inch on each side of that line, cut them apart, press open gently. 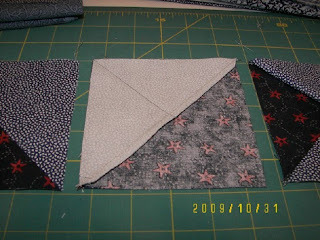 and voila, you have 2 half square triangles, aka HSTs. 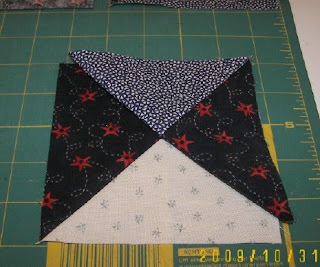 For a 3-color Quarter Square Triangle - Do you see the 4, 4-piece units on the around the blue/red star, surrounding the red center? Determine the finished size of the unit. In this case it is 4 inches. 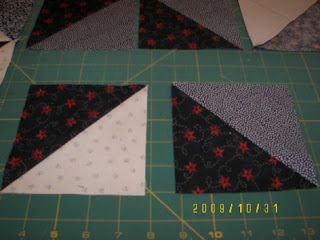 ADD 1 and 1/4 inches (Quarter Square Triangle = add 1 and 1/4 inches) to a dark square and a medium square, and a second dark square and a light square (the two darks are the points of the star, in this case). So each of these 4 squares are cut 5 1/4 inches. Place right sides together of dark & medium, and the right sides together of dark & light, draw line on diagonals, and sew 1/4 inch on each side. 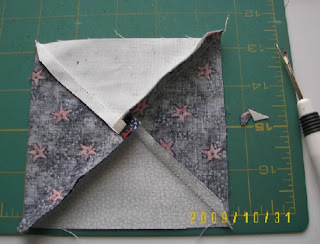 Cut on the line, press open gently - you should have 2 HSTs, with different colorations. Now, put them together again, right sides perfectly together, and draw another line on the diagonal. Peek to be sure you have them in the right direction - seams should be opposing, and be sure to get the center matched perfectly. Sew 1/4 inch on each side as before, cut and press open. You're done! So much easier than fussing with little separate triangles! It should look like this above (although mine is not sewn). Desired result on the back - I like to open up that center seam and twirl the seams. The seams on half the units will twirl in one direction, and the other direction on the other half of the units. These turned out completely accurate. I trimmed off the points. If you are still a little shakey on this technique, sit down and practice. Some of us learn by reading, many of us by doing. I showed this to DH and he was totally amazed - as if it was magic! Those are beautiful star blocks. Also, you did such a nice tutorial/explanation of the different triangle units. Nice job on explaining the different triangles. I prefer the second block but it's probably quite a bit harder to do. Good explanation. I find it also true that writing it out takes a lot longer than doing it. Some 'students' like the words, some like the pictures, and others just want you to show them and then try it for themselves. I like your star with the nine patches in the corners! Your Scrappy star struck looks wonderful. I thought the tutorial was great too. I believe you about the writing taking longer than the doing. Good instructions tho, and great looking stars! Also, your Star Struck turned out great! And on point! 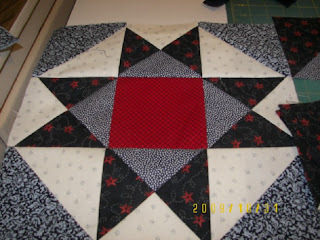 Great colors and quilting too! I still need to put borders on mine. This is exactly the information I was looking for this weekend. I ended up cutting my square a bit larger than I needed and trimmed them to size. Thank you for the instructions though because now I have it for the future. Great looking blocks by the way, I love your color choices. Good job on the tutorial. Writing out the instructions is tough to do! 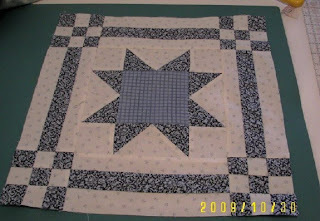 I love your stars - my favorite is the first one with the nine-patch corners. is it a man thing..... they think Quilters have to do things the long way.